Towneley Hall became a museum in 1903, and as a result the Victorian art collection was built up retrospectively. Siobhan Forshaw, a volunteer at the Towneley Hall Art Gallery and Museum, asked Art Detective to help provide information on Paul-Albert Girard, his life and art career. In particular, she wanted to learn more about the piece in their collection titled 'Moorish Courtyard'. Regular contributor Martin Hopkinson provided extensive information on the artist, along with possible sources to consult. The great-grandson of Girard also came forward, saying that he unfortunately had only a little biographical information on Paul-Albert Girard. Martin Hopkinson discovered a useful source on Girard; K. G. Saur’s 'Allgemeines Kunstler-Lexikon', LV, 2007, p.160. Saur gives an extensive biography of Girard. Girard studied at the Ecole des Beaux Arts from 1857, a pupil of Jean Joseph Bellel as well of Flandrin and Picot. He painted portraits and landscapes of Normandy, the Loire Valley, Campagna, and Sicily, influenced by the Barbizon School and Corot. He also painted street scenes in Algiers and Kabylie. Despite being influenced by the Barbizon school, he was best known as an Orientalist painter and was recorded in many books on Orientalist painting. Girard won the Grand Prix de Rome in 1861 in the field of 'peinture historique'. He exhibited at the Salon from 1859 to 1913, at the Dijon Salon from 1887 to 1910, and at the Salon des peintres orientalistes. He was made a Chevalier de la Legion d'Honneur in 1895. Hopkinson later noted that as the painting dated from the 1870s it is not possible to identify it in the catalogues of the salon. 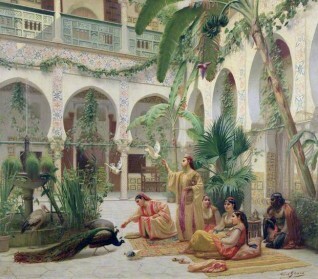 A painting of the same courtyard was sold at Christies, New York, 1st November 2001, titled ‘A Dance in the Harem Courtyard’. 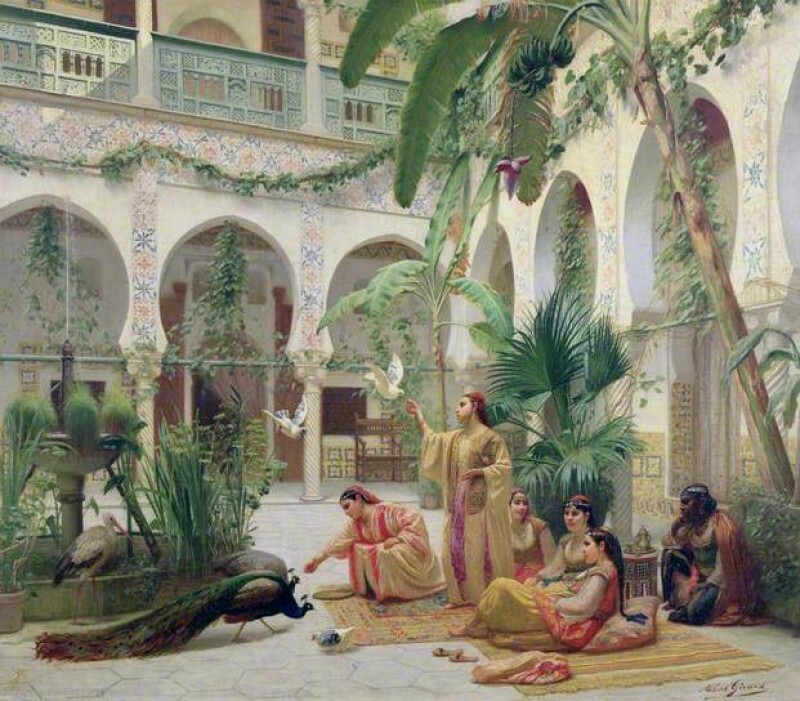 Hopkinson also posits that the work is perhaps comparable with Gustave Boulanger's 1877 scene in a courtyard, 'Interior of a harem', sold at Sothebys in New York, 2 November 2001, lot 34. The catalogues of the Royal Manchester Institution were recommended as a source to discover the painting's origin. Townley Hall gave their thanks for all the information supplied, noting they had very little prior information on the piece. Rebecca Hill, the art curator at Blackburn Museum & Art Gallery and also Towneley Hall, in an effort to supply explanation as to how the piece came into the museum's collection, assumed that the Burnley Corporation, who purchased the piece, were able to get some very reasonably priced works, as Victorian art was well out of fashion by then. Andy Mabbett started a Wikipedia article on the artist: https://en.wikipedia.org/wiki/Paul-Albert_Girard, hoping that others may be inspired to contribute or start their own articles on artists.